You, yes you, can make this bread. I promise. Doesn't it look just like something you would pay $8 for from an upscale artisan bakery? I don't know about you, but I would be willing to pay $8 for this bread. What if I told you that you could make this bread, all by yourself, for less than $1? You will totally impress your friends and family with this beautiful bread and they will refuse to believe how easy it is! It's true, my friends. It can be done. And guess what? You don't even have to good at baking. And you don't have to know how to knead bread. And you don't need fancy mixers. The recipe simply calls for 4 ingredients and a secret weapon - the humble Dutch Oven. What is a Dutch Oven? Well, it's basically a big oven-proof dish with a lid. Most are made from cast iron, but some are ceramic. When I'm making this bread, I use my enameled cast iron Dutch Oven, but I've also used the Pyrex casserole dishes with lids. If using the small Pyrex dishes, I divide the dough in half to make two loaves, instead of the one large loaf I make in the cast iron Dutch Oven. Whatever you choose to use, make sure it can handle high heat (450 degrees) and that the lid fits well. Now, let me be perfectly honest here. I hate it when I see recipes that say "So easy! So fast!" and then I read the instructions only to realize it's NOT easy or fast. This recipe only requires about 5 minutes of hands-on time and is VERY easy, but there is a lot of planning ahead, waiting and setting timers. This is a bread to bake while you are home for a good chunk of the day, at least 3 hours. Also, the dough needs to be mixed/prepared at least 12 hours ahead of the baking time (24 hours is even better), so you'll have to do some planning ahead... which is not my strong suit. 1. Mix all the ingredients together with a wooden spoon in a large bowl or container. A big glass bowl with a plate as a lid works great too. The lid does not have to be air tight (in fact, it should not be - the gases need to escape during fermentation). Leave the loosely covered container/bowl of dough on the counter (not the fridge!) for 12-24 hours. Go on with your business of living while the dough works it's magic. 3. Dump the dough out of the bowl onto the floured surface. It will be a wet, sticky mess. Sprinkle the dough with a little more flour and attempt to fold the dough in half a couple times, working the dough no more than about 10 seconds. I like to use this plastic scraper I got at the dollar store to help me turn it over and get the sticky bits off the counter. After folding it, cover the dough with a tea towel or flour sack towel and let it rest for 15 minutes. Go putter around for a while. 4. When the 15 minutes is up, take off the towel and lay it on the counter. Coat the same tea towel with flour or cornmeal (my preferred choice) to keep the dough from sticking. Use more than you think you should. Now gently gather up the dough in your hands and try to shape it into a ball. Sprinkle with more flour if needed. This should take no more than 10 seconds or so. Don't overwork the dough. You'll end up with a ball with a smooth top, but wrinkly seam on the bottom. Perfect. 7. About 30 minutes before the 2 hour "nap" is over, you'll need to start preheating your oven to 450 degrees with the Dutch Oven inside it! It is very important that both the oven and the Dutch Oven are hot. When the 2 hour rest time is over, put on your oven mitts and pull out the extremely hot Dutch Oven and remove the lid. Now comes the hardest part. You will need to open the towel, carefully pick up the dough, still in the towel and flip it into the steaming hot Dutch Oven so the seam side is now facing up. Do it quickly and confidently (even if you don't feel confident). Even if it looks like a mess when you dump it it, it will still turn out delicious. 8. Place the lid back on (with your oven mitts on!!!) and slide the Dutch Oven back into the oven. Bake for 30 minutes. After the 30 minutes is up, remove the lid and continue baking for 15 minutes. 9. Ta-da! Your bread is done. 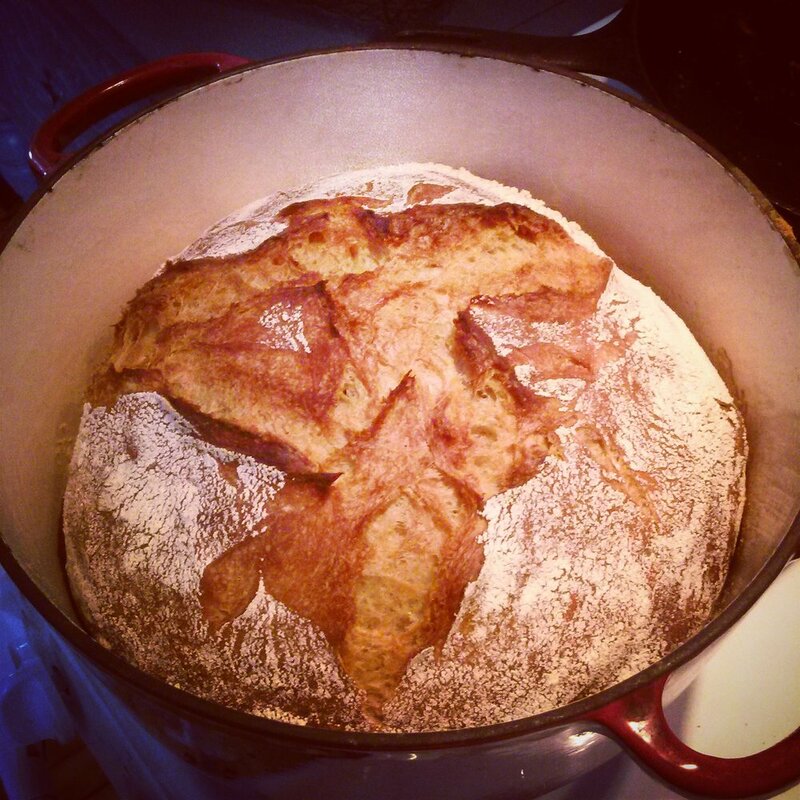 Pull the Dutch Oven out and remove the loaf. Allow the loaf to cool on a wire rack before slicing (yeah right... I can never resist cutting off a little piece and slathering it with butter while it's still piping hot). I discovered that this recipe actually makes INCREDIBLE pizza dough as well… and I’ve even had a friend share that she’s used it successfully for Cinnamon Rolls too! Follow the directions for making the bread, but when you get to Step 7 (when you preheat the oven and transfer the dough to the Dutch Oven), instead you will divide the dough in half and press it into greased cast iron pans. I like to rub a little olive oil on the edges of the crust and sprinkle with a little salt and Italian seasoning. Bake the pizzas at 450 degrees for about 12-18 minutes… or until they are golden and bubbly. Let me know if you try the recipe! It’s a real crowd pleaser and if you’re new at making bread, I think you’ll love how easy and simple this recipe is.